Platforms: Windows 7 or newer. Support for other operating systems may be added later on. 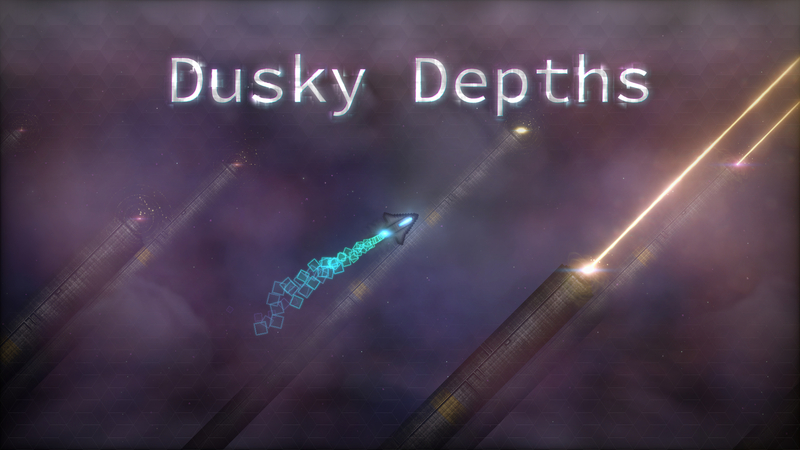 In Dusky Depths you control a small but powerful ship with which you try to survive in various game modes. At your arsenal are many deadly weapons and ship augmentations of which some are quite common while others are very rare. The use of those items is limited by your ship’s resources: energy and material. Energy regenerates constantly while material is finite and needs to be either found on the map or bought at shops. Carefully selecting your ship loadout for the resources that are available to you is vital in order to come out on top. The goal of the main game mode, the rogue-lite adventure mode, is to find so called teleporter fragments. But watch out — enemies will try to stop you by either directly attacking you or by setting up cunning traps. Eventually, after having found all fragments, you’ll be able to build a teleporter with which you can progress to the next level — if you can defend the teleporter construction, that is. Setting up defenses such as turrets and walls is the key to successfully defending the construction site. However, even if you fail, every new run will allow you to unlock new ships and items. The game features various worlds, each with different gameplay characteristics. In the rogue-lite adventure mode, maps are semi-randomly generated by procedurally pieceing hand-crafted map segments together. This diversifies the gameplay experience without sacrificing the detail that carefully hand-crafted maps offer. For player-versus-player gamemodes however, completely hand-crafted maps can also be created with the Tiled map editor. A core mechanic of the game is the full destructability of terrain. This feature coupled with the fully featured physics simulation allows the player to create completely new paths or setup all sorts of map contraptions to their advantage. Marian “Nitroxis” Ryt (@ntrxs), who works on engine programming, game programming and server administration. Robin-Sebastian “Rob” Köhler (@RedwoodRobbe), who works on game programming, game concept, game art design, music and webdesign.